I got a sample of this in my most recent Target beauty bag (I highly recommend following Target’s Facebook because they give out free beauty bags once a season – around 4 times a year – but they go quickly so the best way to get them is to get advance notification through the Facebook page). 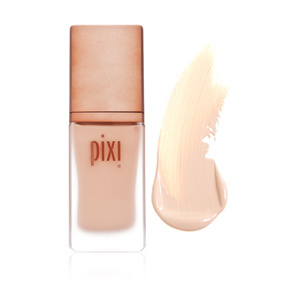 Pixi Beauty Primer No.1 Even Skin retails at an astounding $29.00 at Target/online. Well – it certainly illuminates – a little too well. It gave my face a quite alarming glow, in fact, to the point that my skin looked almost oily. It went on easily and I was able to rub it into my skin, but it’s simply too bright – it gave my face an unnatural all-over pink flush, unlike any other primer I’ve ever tried. I have fair skin, but not extremely fair, so I can’t imagine what it would do to someone with pale skin. Having said that, it does give a glow, stayed on fairly well and didn’t dry out my skin, so if you have tanned or dark skin, I would recommend trying this – it may be exactly what you’re looking for. As for me, however, I’m going to stay far far away – and I recommend anyone with fair skin doing the same unless you want to look faintly intoxicated.